Field Broadcast, which kicks off tomorrow and runs through May 17th, will present unedited, live streams of a series of artworks from thirty-three artists captured in fields (yes, the green, earthy kind) to your desktop. When I first read about the show on Networked Music Review, it reminded me a bit of David Claerbout's Present, a work he created for Dia's Artist Web Projects in 2000. Present is an application that allows the user to watch the full lifespan of a flower on their desktop. 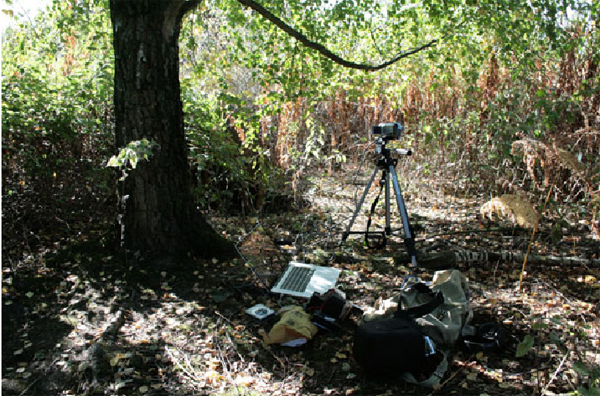 Like the Field Broadcast exhibition, it inserts a semblance of the natural or the organic into the virtual environment. With so many artists involved in Field Broadcast, it will be interesting to see how they interact with their surroundings -- if the fields will factor in as a component or simply become a backdrop.